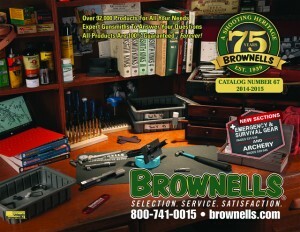 For the 67th consecutive year, Brownell’s has released their all-encompassing catalog often referred to as the gun industry’s “Bible.” This year’s version – #67 – pays homage to Brownells 75th Anniversary with a cover that recreates Bob Brownell’s original desk where he worked on guns in the 1930s and assembled the company’s first catalog in 1947. The 696-page Brownells Catalog #67 features the latest and most popular products for handguns, rifles, shotguns and accessories for shooters and outdoor enthusiasts of all kinds. Presented in Brownells’ unique horizontal format, the catalog is neatly arranged into 35 individual product categories to make finding a specific product easy. New for this year are spreads dedicated to Brownells newest product categories – Archery and Emergency & Survival Gear. The Optics & Accessories category has been expanded by six pages, and the AR-15/M16 section has grown by five pages. Additionally, a condensed Brownells historical timeline can be found near the center of the catalog; the full timeline can be found here. Customers may obtain a catalog by visiting the catalog section of the Brownell’s website or by calling 800-741-0015. Founded in 1939, Brownells provides premier firearms parts, ammunition, gunsmithing tools, reloading components, survival gear and archery products to customers worldwide. Brownells is dedicated to unmatched Selection, unrivaled Service and absolute Satisfaction, as proven by their industry-exclusive 100-percent Forever Satisfaction Guarantee on every product sold. Additionally, their professional gun and archery techs are available to answer customer questions on nearly any firearm or archery-related issue, free of charge. Consumers may order or get more information by calling 800-741-0015 or visiting www.brownells.com.